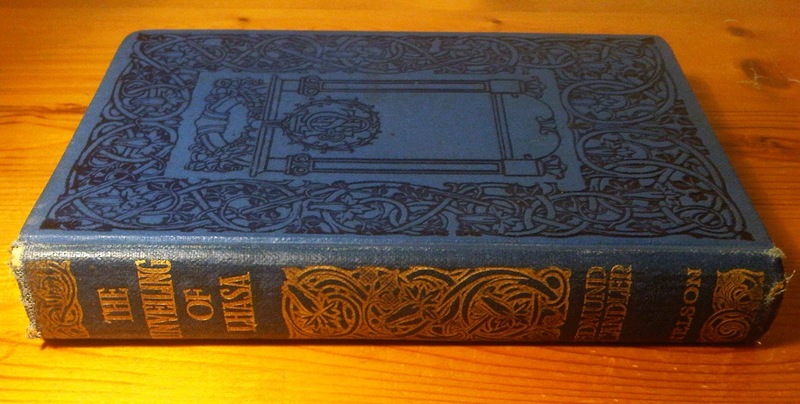 I recently finished reading Edmund Candler’s The Unveiling of Lhasa (Thomas Nelson, 1905). What follows are my first impressions and reflections linking a selection of passages from that text (these centre on themes which I aim to expand upon in my PhD thesis). On the whole I found the book a curious mix. For the most part it is an unpalatable, almost surgical recounting of the military conquest of Tibet. A lot of people die in these pages, and it is hard not to baulk at the fact that the objectivised recounting of these ‘facts’ are not a fiction. These events occurred. The (at times) Boy’s Own adventure-style is deeply apparent. This unfortunate event is perhaps the last 19thcentury-style military Imperialist incursion of the British Empire. It is couched as a heroic “last hurrah”, as Tibet represents a final blank space on the world map. Somewhere to be claimed and conquered. Civilisation pitted against savages. The book overflows with orientalisingtropes, and yet there are moments of poignant detachment – when moral reflections are countenanced, but often subsequently dismissed or explained away in the end. What happened, happened. And it happened for a reason; because it had to happen. And what’s done is done, and henceforth the world (and the British Empire) will be a better place because of it. 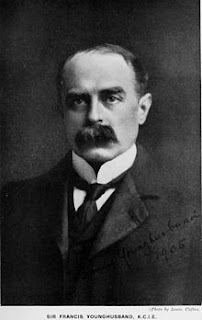 A triumph for the “geniuses” of Empire (in this instance, those geniuses are Sir Francis Younghusband, leader of the military expedition, and Lord Curzon, Viceroy of British-India). The “Unveiling” of the book’s title is telling. Candler’s tone hints at all the inevitable metaphors. The Younghusband Mission of 1904 ends in a marriage of sorts, but it is a shotgun wedding (without any metaphor). A military force enters Tibet, penetrating the sanctity of its holy and forbidden capital city, with murder and plunder marking every painful step of its march. This book reeks of Freudian psycho-babble. But its main thrust is the moral reasoning of a marriage of medievalism with modernity. Tibet is a backward, feudal anachronism which has violently awoken to the realities of modern Western civilisation. 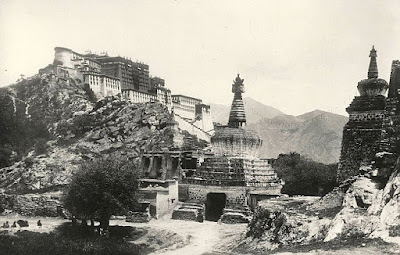 All the way from the Chumbi Valley to Lhasa the British have tried to reason and negotiate with the benighted and duplicitous Tibetans, but their stubborn obstinacy time-and-again has forced the British hand. It is a cultural clash of misunderstandings which can only be overcome by the power of the Maxim gun. Despite the devastating mechanised firepower employed it was touch and go at times, when the “enemy” missed glaringly obvious opportunities to cut off the British line of supplies. 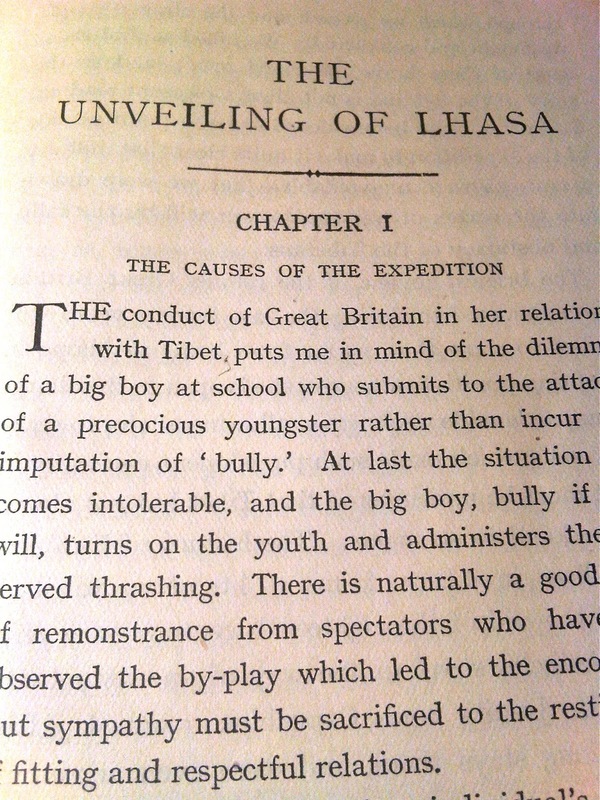 There’s little thought evident in Candler’s narrative that the Tibetans might have been fighting (i.e. – defending themselves) under different terms, and with a contrasting conception of the rules of engagement. Reading these decidedly one-sided pages one can’t help but be aware of the deafening silence of the other side. Many of the British soldiers (officers, certainly) are named, whereas the mass of ‘natives’ – both Sikh and Ghurkha friend and Tibetan foe – are not. I kept thinking of the Spanish Conquest of the Americas. And this is a point which Mary Louise Pratt has used to good effect in her analysis of such colonial encounters. The process of transculturation which takes place in these Western colonial era writings is what interests me too. These types of books were predominantly written by men of Classical education – the struggles (agon) and trials of Homer’s Odysseus and Virgil’s Aeneas soak through their words and redolently permeate their world outlooks; triumph and victory are won through the defeat of adversity. Respect is due to those who evince martial honour; and nobility is conveyed by lofty ideals, upholding reason and the pursuit of higher knowledge – “science” marches in the bloody hobnailed wake of such incursions. Thus civilisation simultaneously justifies and obfuscates its own barbarism; turning the tables on itself, expiating and exculpating all its blinkered ills. It’s all there. Adversity and congenial company. War, weather, and pleasant conversation with one’s chums. “In estimating the practical results of the Tibet Expedition, we should not attach too much importance to the exact observance of the terms of the treaty. Trade marts and roads, telegraph-wires and open communications are important issues, but they were never our main objective. What was really necessary was to make the Tibetans understand that they could not afford to trifle with us. The existence of a truculent race on our borders who imagined that they were beyond the reach of our displeasure was a source of great political danger. We went to Tibet to revolutionize the whole policy of the Lhasa oligarchy towards the [British-]Indian Government. 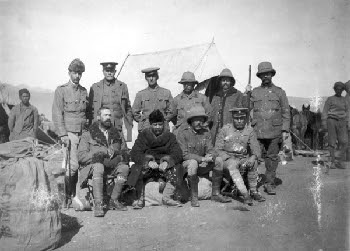 The practical results of the mission are these: The removal of a ruler who threatened our security and prestige on the North-East frontier by overtures to a foreign Power; the demonstration to the Tibetans that this Power is unable to support them in their policy of defiance to Great Britain, and that their capital is not inaccessible to British troops. We have been to Lhasa once, and if necessary we can go there again. The knowledge of this is the most effectual leverage we could have in removing future obstruction. In dealing with people like the Tibetans, the only sure basis of respect is fear. They have flouted us for nearly twenty years because they have not believed in our power to punish their defiance. 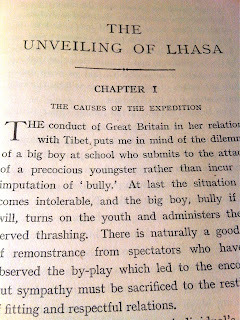 Out of this contempt grew the Russian menace, to remove which was the real object of the Tibet Expedition. Have we removed it? Our verdict on the success or failure of Lord Curzon’s Tibetan policy should, I think, depend on the answer to this question. “If only one were without the incubus of an army, a month in the Noijin Kang Sang country and the Yamdok Plain would be a delightful experience. But when one is accompanying a column one loses more than half the pleasure of travel. One has to get up at a fixed hour – generally uncomfortably early – breakfast, and pack and load one’s mules and see them started in their allotted place in the line, ride in a crowd all day, often at a snail’s pace, and halt at a fixed place. Shooting is forbidden in the line of march. When alone one can wander about with a gun, pitch camp where one likes, make short or long marches as one likes, shoot or fish or loiter for days in the same place. The spirit which impels one to travel in wild places is an impulse, conscious or unconscious, to be free of laws and restraints, to escape conventions and social obligations, to temporarily throw one’s self back into an obsolete phase of existence, amidst surroundings which bear little mark of the arbitrary meddling of man. It is not a high ideal, but men often deceive themselves when they think they make expeditions in order to add to science, and forsake the comforts of life, and endure hunger, cold, fatigue, and loneliness, to discover in exactly what parallel of unknown country a river rises or bends to some particular point of compass. How many travellers are there who would spend the same time in an office poring over maps or statistics for the sake of geography or any other science? We like to have a convenient excuse, and make a virtue out of a hobby or an instinct. But why not own up that one travels for the glamour of the thing? In previous wanderings my experience had always been to leave a base with several different objectives in view, and to take the route that proved most alluring when met by a choice of roads – some old deserted city or ruined shrine, some lake or marshland haunted by wild-fowl that have never heard the crack of a gun, or a strip of desert where one must calculate how to get across with just sufficient supplies and no margin. I like to drift to the magnet of great watersheds, lofty mountain passes, frontiers where one emerges among people entirely different in habit and belief from folk the other side, but equally convinced that they are the only enlightened people on earth. Often in India I had dreamed of the great inland waters of Tibet and Mongolia, the haunts of myriads of duck and geese – Yamdok Tso, Tengri Nor, Issik Kul, names of romance to the wild-fowler, to be breathed with reverence and awe. I envied the great flights of mallard and pochard winging northward in March and April to the unknown; and here at last I was camping by the Yamdok Tso itself – with an army. I can’t help wondering – if Conrad ever read Candler’s newspaper reports from Tibet, or even all of this particular book, The Unveiling of Lhasa – what he and Candler would have said to one another in conversation over this topic. No doubt they saw eye-to-eye on some things, whilst differing over others, as would many other people existing in the context of those times – but how did they each think such a world would play out in the long run, and ultimately might they have been in some sort of accord?